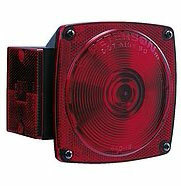 PETERSON left side combination tail light for all trailers under 80" wide. Includes the following functions: stop, turn, tail, rear reflex, side marker, side reflex and license light. Features quick plug-in connections with two extra ports for additional lights. Grounds through mounting studs which are on 2" centers. W: 5" H: 4-1/2" D: 2-7/8"